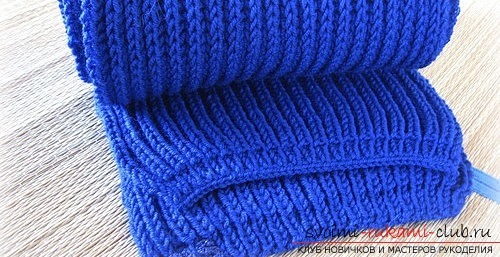 The most common knitting is manualknitting. You need to have a little patience and attention, and also knitting needles and yarns (threads) to learn this craftsmanship. 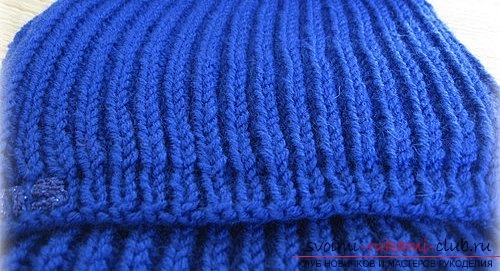 The principle of knitting is simple and is based on the formation of loops, and weave loops. 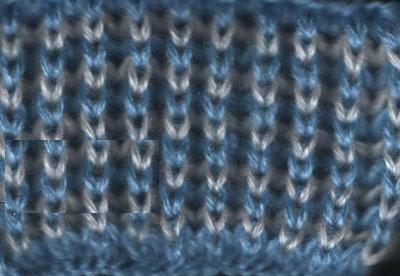 In the whole work without patterns, only one working thread is used. Begin to knit beginners usually with the simplest products - scarves. After all, when knitting a scarf, you do not need to add and subtract loops, add extra threads (we're talking about monotonous scarves), make grooves and cutouts. You just need to memorize the algorithm, and knit it until you connect the desired length of the scarf. 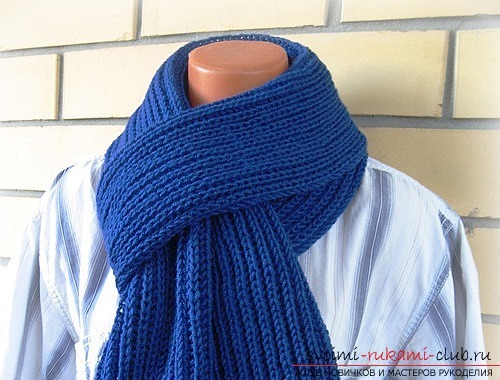 If you are familiar with knitting needles recently, suggest toyour attention is the description of knitting a soft and not very complex man's scarf. Let's make a very nice knitted gift with our own hands. 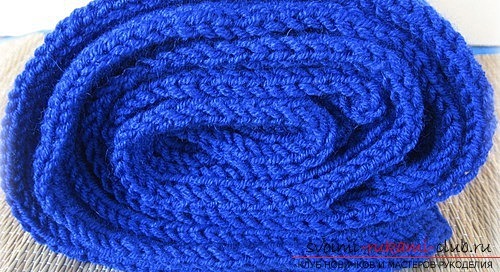 Choose the color of the yarn - for example, it is bright blue. What about the pattern, because there is such an abundance? If you still have not decided on what kind of pattern you want to knit a product, we recommend choosing the most common English elastic band. I specify at once that such a binding, of the English type, leaves more thread, i.e. almost twice as much yarn is needed as compared to a simple rubber band. Here, each row we are tying in two sets. And the canvas turns so fluffy and soft, two-sided and almost does not spring - an ideal canvas for a scarf. How do we work with an English rubber band: First row: One face loop, one eyelet is removed with a crochet Row of the second: in the previous row, remove the loop with a crochet, tie it together with a face loop, and again one loop is removed with a crochet. The pattern repeats, starting with the second row. You see, nothing complicated, everything is simple andlaconically! The main thing to remember is where the nakids are made, and where the eyelets are removed. At the fifth minute of knitting, you can not even look at the diagram, so everything is available for describing. When knitting this scarf, we use knitting needles number four and mixed yarn with merino wool. The scarf turned out to be almost two meters long (one hundred and ninety centimeters), and a width of twenty-five centimeters. On all we took about two hundred grams of yarn. But it all depends on the type of yarn that you choose for work. We look, that at us it has turned out. Today we tried to knit a scarf for beginners,We hope that you will be able to do it yourself, even if you did not even hold the spokes before. Gradually, by tying from simple scarves to complex ones, you will be able to master the basics of knitting, different techniques, the ability to read patterns and pick up yarn and knitting needles. The master class will teach you how to create knitted toys with your own hands, the hare crochets.